Cross-posted from Arms Dealers on Trial © Jason N. Parkinson/reportdigital.co.uk In defiance of corporate pressure, the film Arms Trade On Trial has been released, which documents our attempts to hold arms dealers from the DSEI arms fair to account for the promotion of illegal torture weapons. The activists who were trying to bring a private prosecution against arms companies that exhibited at the DSEI have unfortunately had to discontinue their legal action. 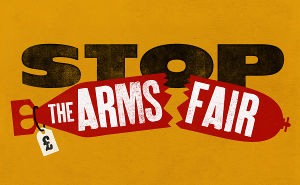 You can read their statement on the Arms Dealers on Trial website. 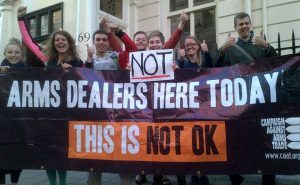 DSEI arrestees privately prosecute arms dealers! 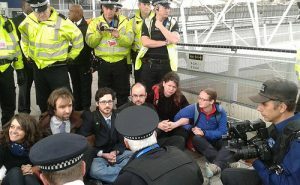 Yesterday (Tuesday 18 February 2014) the CPS dropped its charges against the activists arrested during the day of action against the DSEI Arms Fair on 8 September 2013. Different activists had been charged with different offences including obstruction of the highway and obstructing a police officer.